Even though bulbs store food for themselves, you need to help them out at planting time for best results by preparing soil for bulbs. This is the only chance you get to put fertilizer below the bulb. In order for the bulbs you plant to make use of food available in the soil, you need to start with healthy soil. Then, you need to know when to fertilize bulbs after that. For fertilizing bulbs, fertilizers can be inorganic which means they are chemically treated or laboratory created. They can also be organic, which means they came from natural or once-living sources. Your plants won’t care which one you use, but depending on your beliefs, you can choose the type that best fits in with your feelings on the issue. Inorganic fertilizers are more readily available, but be careful when using these, as fertilizing bulbs with inorganic fertilizer can burn roots, the basal plate or even the leaves if the plant comes in direct contact with the fertilizer. 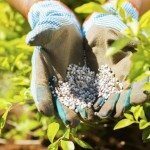 Fertilizers come in granular or liquid form and are easy to apply at planting time. Granular fertilizers are better because they don’t dissolve as quickly. They remain in the soil longer, and the longer the better. Nitrogen is important for preparing soil for bulbs to be able to start their leaf growth. Phosphorus and potash are good for overall health, resisting disease, root growth and flowering. You will find the proportions on the side of the fertilizer bag or bottle listed as N-P-K ratios. Remember when fertilizing bulbs, not to over-fertilize and never increase an application above the directions on the container. This can damage or even kill the plants. In order to apply the fertilizer, mix the granular fertilizer with the soil at the bottom of the planting holes. If you’re using inorganic fertilizer, add a layer of unamended soil to the hole as well because you want the bulb to sit on fresh soil rather than come in contact with any of the fertilizer. Organic matter is used when preparing soil for bulbs to improve the soil by improving low fertility, poor water-holding sandy soils and fertile but poorly-draining clay soils. When you add organic matter to your soil, remember it gets used or breaks down each year and has to be replenished annually. It’s easier to amend the soil when you first dig up the garden before planting each year. This way you can layer on about 2 inches of organic matter and work it in well with what soil you had. In future years, you can simply apply the organic matter as mulch and it will work into the soil below. In subsequent years, when flowering might be diminishing, you will need to be fertilizing bulbs in your garden. The best time when to fertilize bulbs is to wait until the bulb’s leaves are well out of the ground and then fertilize at half strength. Then, once the bulbs have finished flowering, you can fertilize once more. A third feeding would be okay two weeks after the second feeding, again at half strength. Half strength is easy to figure out. You would just double the water or halve the fertilizer. If the label suggests 2 tablespoons to a gallon of water, either add 1 tablespoon to the gallon or 2 tablespoons to 2 gallons of water. You can fertilize summer flowering bulbs the same way you would any other perennial in the summer garden. Remember that fertilizer is only available to the plant when there is water available to transport the nutrients up the roots from the soil. If there is no rain, be sure to water the bulbs as soon as they are planted and continuously through the growing season when it’s not raining.